Tom Budgen (born May 19, 1985) is a Dutch professional wrestler better know under the ring name Aleister Black. He is currently signed to WWE performing on the SmackDown brand. During his time in NXT he became a one-time NXT Champion. Prior to signing with WWE, Budgen worked for promotions across Europe, the United States, and Japan under the ring name Tommy End. As Tommy End he most notably wrestled for Insane Championship Wrestling, Progress Wrestling, Pro Wrestling Guerilla and Westside Xtreme Wrestling. In promotions he held numerous championships including, the wXw Unified World Heavyweight Championship, wXw World Lightweight Championship, wXw World Tag Team Championship, ICW Tag Team Championship, and the Progress Tag Team Championship. He then signed to WWE in June 2016. He debuted for WWE's NXT at 2017's NXT TakeOver: Orlando defeating Andrade "Cien" Almas. He then feuded with Velveteen Dream during the year and then set his eyes on the NXT Championship. At NXT TakeOver: New Orleans in April 2018, Black defeated Almas again to win the NXT Championship. He held the title until July 2018 when he lost it to Tommaso Ciampa, due to interference by Johnny Gargano. He then feuded with Ciampa and Gargano for majority of 2018, into the beginning of 2019. On January 27, 2019, he entered the Men's Royal Rumble for the first time. In February 2019, Black started appearing on the main roster, making appearances on Raw and SmackDown Live. This led to him teaming with Ricochet and challenging for the Raw Tag Team Championship at Fastlane. Budgen is known for having an extended background in martial arts, and has competed in various martial arts such as kickboxing and Maan Karate from ages 9 to 15. He still trains kickboxing to this day. He has adapted most of his background into his style, giving him a unique striking ability, and is known for utilizing devastating striking combinations to finish opponents. Kickboxing remains the biggest influence on his style. In an interview with Colt Cabana, Budgen revealed that his father grew up in a religious cult. In the same conversation, he credited this as the inspiration for a lot of his dark and occult-driven personas in professional wrestling. Budgen wrestled extensively on the independent circuit in the United Kingdom and Europe under the ring name Tommy End, working for promotions like Pro Wrestling Holland, Insane Championship Wrestling, Progress Wrestling, Westside Xtreme Wrestling, Over the Top Wrestling, Revolution Pro Wrestling and Pro Wrestling Showdown among others. He also worked for international promotions, such as North America's Combat Zone Wrestling, Evolve and Pro Wrestling Guerrilla as well as the Japanese promotion Big Japan Pro Wrestling. End held numerous championships, among other accolades he is a former: wXw Unified World Heavyweight Champion, wXw World Light Heavyweight Champion, wXw World Tag Team Champion, ICW Tag Team Champion, Progress Tag Team Champion. In June 2016, it was reported that Budgen had signed with WWE. He reported to the WWE Performance Center on 19 October. On November 3, End appeared on a house show at Ft. Pierce, Florida and cut a promo saying that he came to NXT to "burn" it down. On 11 November, at a house show in St. Augustine, Florida, End made his in-ring debut, defeating Lince Dorado. 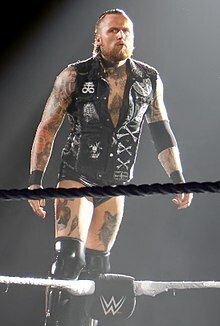 On 7 January 2017, Budgen debuted the new ring name "Aleister Black". On January 15, Budgen made a surprise appearance at the WWE UK Championship Tournament finals as Tommy End, losing to Neville in a non-tournament match. Vignettes began to air from the 8 March episode of NXT promoting Black's television debut at NXT TakeOver: Orlando. At NXT TakeOver: Orlando, Black made his televised in-ring debut as a face, defeating Andrade "Cien" Almas. In May, Black made his main roster debut on WWE Main Event while on the European Tour, defeating Curt Hawkins. On the June 21 edition of NXT, he defeated Kassius Ohno. On the August 2 edition of NXT, prior to Black's match against the debuting Kyle O'Reilly, Hideo Itami cut a promo in the ring, demanding respect. Black interrupted Itami, resulting in a stand-off between the two. Black performed Black Mass on Itami, and defeated O'Reilly. Itami attempted to attack Black afterwards, but the two were eventually separated. At NXT TakeOver: Brooklyn III, Black defeated Itami. Black began a feud with Velveteen Dream, where Dream constantly stalked and harassed Black in order for him to say his name. This led to a match at NXT TakeOver: WarGames, which Black won. After the match, Black sat next to a dazed Velveteen Dream, before ultimately saying his name. On the December 13 episode of NXT, Black defeated Adam Cole to qualify for a number one contender's fatal-four way match for the NXT Championship, which also involved Johnny Gargano, Killian Dain and Lars Sullivan on the December 27 episode of NXT, which Gargano won by pinning Black (marking his first pinfall defeat on NXT) after interference from The Undisputed Era. At the NXT Year-End Awards, Black won three awards for Rivalry of the Year (with Velveteen Dream), Breakout Star of the Year, and Male Competitor of the Year. Black defeated Cole in an Extreme Rules match at NXT TakeOver: Philadelphia. On the February 14, 2018 episode of NXT, he said that he had "a devil on [his] back", which was the NXT Championship. He was then interrupted by Killian Dain, whom he defeated on the March 7 edition of NXT to become the number one contender for the NXT Championship. He received his title opportunity against Andrade "Cien" Almas at NXT TakeOver: New Orleans on April 7, where he won to become the new NXT Champion. On the May 30 episode of NXT, Black was interrupted by Lars Sullivan, who wanted a shot at the NXT Championship. On that same episode, it was revealed that Sullivan would face Black for the NXT Championship at NXT TakeOver: Chicago II, where Black successfully retained his title. Black lost the championship to Tommaso Ciampa at the July 18 NXT TV tapings for the July 25 episode after Johnny Gargano interfered and accidentally hit Black with the title belt. The following week, during Ciampa’s address to the NXT Universe, he approached the ring, only for Gargano to run out ahead of him to attack Ciampa, after which he attacked Gargano with a Black Mass before indicating that his NXT Championship loss was Gargano’s fault. On the August 8 episode of NXT, Black faced Gargano in a singles match, only for Ciampa to interfere. The three would ultimately brawl until NXT General Manager William Regal would appear and turn Black and Ciampa's singles bout for the NXT Championship at NXT TakeOver: Brooklyn 4 into the first-ever triple threat match for the title, involving Gargano. However, after the show, Black was found unconscious by referees and Regal himself in the parking lot outside the arena after being attacked by an unseen and unknown assailant. It was later reported that Black was sent to a local medical facility, and was announced as being unable to compete, both due to the on-screen incident and Black suffering a legitimate groin injury at an NXT Live event in Las Vegas. After being out of action for two months, Black returned on the October 17 episode of NXT, confronting Nikki Cross, who revealed that Gargano was the one who had attacked him. A match between Black and Gargano was scheduled for NXT TakeOver: WarGames, in which Black was victorious. On January 26, 2019 he competed at NXT TakeOver: Phoenix for the NXT championship but he was defeated by Tommaso Ciampa. The next night on January 27, 2019, he entered the Men's Royal Rumble match at Number 21, lasting 6:09 before being eliminated by Baron Corbin. Black made his official main roster debut on the February 18 episode of Raw, defeating Elias. The next night on SmackDown, he defeated Andrade. Over the next few weeks, Black formed a tag team with Ricochet and entered NXT's Dusty Rhodes Tag Team Classic while also earning a Raw Tag Team Championship match at Fastlane. At Fastlane, Black and Ricochet lost in a triple threat match to The Revival and the team of Bobby Roode and Chad Gable. After winning the Dusty Rhodes Tag Team Classic on March 27, 2019, they earned themselves an opportunity to compete for the NXT Tag Team Championship against War Raiders at NXT TakeOver: New York, which they would subsequently lose. The next day, Black and Ricochet would compete at WrestleMania 35 in a fatal four-way tag team match for the WWE SmackDown Tag Team Championship against The Usos, Rusev and Shinsuke Nakamura, and The Bar. The Usos would go on to retain their titles in the match. Black was then drafted to Raw in the 2019 WWE Superstar Shake-up. However, on April 22, Black was re-drafted to the SmackDown brand, due to his real-life wife Zelina Vega being drafted there. Budgen married fellow professional wrestler Zelina Vega in 2018. ^ "Tommy End". Cagematch. Retrieved December 27, 2016. ^ a b "Aleister Black". WWE. ^ "PROGRESS Chapter 26: Unknown Pleasures – PROGRESS Wrestling – Watch Online for Just $7.50 – Demand Progress". Demand Progress. ^ a b c d e Clapp, John. "Tommy End, Big Damo and "Crazy" Mary Dobson join WWE Performance Center". WWE. Retrieved October 19, 2016. ^ a b c d e f g "Kader". wXw – more than Wrestling. Archived from the original on March 19, 2016. ^ "Devil's Blood on Twitter". ^ ColtCabana (24 June 2015). "Tommy End (Aleister Black) Ep 256 - Colt Cabana's AOW Podcast" – via YouTube. ^ "Roster". This. Is. Progress. Archived from the original on 2016-03-04. Retrieved 2016-02-29. ^ "RPW, "SUMMER SIZZLER", 2015/06/14 York Hall, London Review". Theindycorner.com. Retrieved 2016-03-01. ^ "An Interview With Tommy End". Snapmarenecks.com. Retrieved 2016-03-01. ^ "Tommy End". Profightdb.com. Retrieved 2016-03-01. ^ Philip Kreikenbohm. "BJW". Cagematch.net. Retrieved 2016-03-01. ^ Philip Kreikenbohm. "Matches « Tommy End « Wrestlers Database". Cagematch.net. Retrieved 2016-03-01. ^ "Dragon Gate Homebase". Dgusa.tv. Archived from the original on 2012-12-06. Retrieved 2016-03-01. ^ Philip Kreikenbohm. "Titles « Tommy End « Wrestlers Database". Cagematch.net. Retrieved 2016-03-01. ^ Radican, Sean (2016-06-05). "PWTorch Report – int'l star Tommy End heading to WWE". Pro Wrestling Torch. Retrieved 2016-06-06. ^ Williams, JJ (2017-01-07). "NXT Ocala, FL, live results: Tommy End gets a new name". Wrestling Observer Newsletter. Retrieved 2017-01-08. ^ Tyler Bate becomes the first WWE United Kingdom Champion in historic WWE UK Championship Tournament. WWE. Retrieved on 2017-06-06. ^ NXT TakeOver: Orlando: April 1, 2017. WWE (2017-04-01). Retrieved on 2017-06-06. ^ Cox, James (May 13, 2017). "WWE MAIN EVENT RESULTS: ALEISTER BLACK MAKES HIS SHOW DEBUT". Wrestling Observer Newsletter. Retrieved March 4, 2019. ^ Callicutt, Chris. "WWE NXT Results (6/21): Ohno Vs. Black Main Event, Moon Stuns Royce, DeVille Cruel To Evers, More". Retrieved 30 June 2017. ^ "Aleister Black def. Kyle O'Reilly after a confrontation with Hideo Itami". WWE. ^ WWE (2 August 2017). "Footage shows Hideo Itami trying to jump Aleister Black in the parking lot: Exclusive, Aug. 2, 2017" – via YouTube. ^ "NXT Takeover Brooklyn Results: Hideo Itami vs. Aleister Black - Wrestlezone". 19 August 2017. ^ "NXT TakeOver War Games Live Results, News & Recap". Wrestling Observer. Retrieved 19 November 2017. ^ "Aleister Black and Killian Dain wage war amid NXT Title aspirations". WWE. ^ Moore, John. "4/7 Moore's NXT Takeover: New Orleans live review – Andrade Almas vs. Aleister Black for the NXT Title, Ember Moon vs. Shayna Baszler for the NXT Women's Championship, Johnny Gargano vs. Tommaso Ciampa in an unsanctioned match, ladder match for the new North American Championship". Pro Wrestling Dot Net. Retrieved April 7, 2018. ^ "WWE is making sure you know a big thing happened at the NXT taping on July 26(SPOILER)". ^ James, Justin. "8/8 NXT TV REPORT: Aleister Black vs. Johnny Gargano, Kassius Ohno vs. Adrian Jade, Nikki Cross vs. Amber Mova, Keith Lee vs. Marcel Barthel". Pro Wrestling Torch. Retrieved August 8, 2018. ^ Powell, Jason (February 18, 2019). "2/18 Powell's WWE Raw TV Review: NXT talent debut, Braun Strowman vs. Baron Corbin in a tables match, the night after Elimination Chamber, and the road to WWE Fastlane begins". Pro Wrestling Dot Net. Retrieved February 22, 2019. ^ Bristout, Ralph (April 5, 2019). "NXT Tag Team Champions The War Raiders def. Aleister Black & Ricochet". WWE. Retrieved April 13, 2019. ^ Melok, Bobby (April 7, 2019). "The Usos def. Aleister Black & Ricochet, The Bar and Shinsuke Nakamura & Rusev". WWE. Retrieved April 13, 2019. ^ Satin, Ryan (November 30, 2018). "Aleister Black And Zelina Vega Recently Got Married". Pro Wrestling Sheet. Retrieved February 2, 2019. ^ Philip Kreikenbohm. "Title Reigns « CWN Mittelgewichtsmeisterschaft Championship « Titles Database". Cagematch.net. Retrieved 2016-03-01. ^ a b "Tommy End". Catch-arena.com. Retrieved 2016-03-01. ^ Philip Kreikenbohm. "Title Reigns « FWG Lightweight Championship « Titles Database". Cagematch.net. Retrieved 2016-03-01. ^ Philip Kreikenbohm. "Title Reigns « FCP Championship « Titles Database". Cagematch.net. Retrieved 2016-03-01. ^ Adam Cole vs Tommy End (Fight Club Pro). 15 June 2014 – via YouTube. ^ "Fight Club:PRO". Fightpro.tumblr.com. Archived from the original on 2016-10-09. Retrieved 2016-03-01. ^ Axel Saalbach. "Wrestlingdata.com – The World's Largest Wrestling Database". Wrestlingdata.com. Retrieved 2016-03-01. ^ "ICW: Tommy End". Insanewrestling.co.uk. Archived from the original on 2017-10-02. Retrieved 2016-03-01. ^ Philip Kreikenbohm. "Title Reigns « ICW Tag Team Championship « Titles Database". Cagematch.net. Retrieved 2016-03-01. ^ "ICW Tag Team Championship". Insanewrestling.com. Archived from the original on 2017-09-16. Retrieved 2016-03-01. ^ Philip Kreikenbohm. "Title Reigns « ICWA Heavyweight Championship « Titles Database". Cagematch.net. Retrieved 2016-03-01. ^ "ICWA / NWA France Heavyweight Title". Wrestling-Titles.com. ^ Philip Kreikenbohm. "Title Reigns « ICWA France Heavyweight Championship « Titles Database". Cagematch.net. Retrieved 2016-03-01. ^ Philip Kreikenbohm. "Title Reigns « ICWA European Tag Team Championship « Titles Database". Cagematch.net. Retrieved 2016-03-01. ^ Title Reigns « PWH Tag Team Championship « Titles Database « CAGEMATCH – The Internet Wrestling Database. Cagematch.net. Retrieved on 2017-06-06. ^ SHOWDOWN 9 Aftermath. Terry Daniels backstage met PWS Heavyweight Champion:Tommy End. 17 February 2013 – via YouTube. ^ "Heavyweight Championship". Pro Wrestling Showdown. Archived from the original on 2016-03-05. Retrieved 2016-03-01. ^ "Results". This. Is. Progress. Archived from the original on 2016-01-24. Retrieved 2016-02-29. ^ PROGRESS Chapter 30: Super Strong Style 16 Tournament Edition 2016 – Tag 2 « Events Database « CAGEMATCH – The Internet Wrestling Database. Cagematch.net. Retrieved on 2017-06-06. ^ Martin Bean. "History". Southsidewrestling.co.uk. Retrieved 2016-03-01. ^ "Results: Southside Wrestling Entertainment – 4th Anniversary Show – 10/25/14 – Stevenage, England". Cheap-heat.com. Archived from the original on 2016-03-10. Retrieved 2016-03-01. ^ "Updated Card: SWE (@SouthsideWE) "4th Anniversary: Rumble"". Hashtag Wrestling. Archived from the original on 2016-10-09. Retrieved 2016-03-01. ^ "World Tagteam Championship". Westside Xtreme Wrestling. Archived from the original on 2017-03-24. Retrieved 2016-06-06. ^ "Champions". wXw – more than Wrestling. ^ Philip Kreikenbohm. "Chase The Mahamla". Cagematch.net. Retrieved 2016-03-01. ^ wXw World Lightweight Tournament « Events Database « CAGEMATCH – The Internet Wrestling Database. Cagematch.net (2006-09-16). Retrieved on 2017-06-06. ^ a b c "NXT TakeOver Philadelphia live results: Almas vs. Gargano". Wrestling Observer. Retrieved 28 January 2018. This page was last edited on 22 April 2019, at 20:50 (UTC).